Co-sleeping gets a lot of press these days. (We write about the topic quite often ourselves!) But, as we are quick to point out in our articles, co-sleeping can be kind of a misleading term. Some parents who share a bed with their babies call it co-sleeping; other parents who share a room with their babies call it co-sleeping. But sharing a room is quite different than sharing a bed…so maybe we need a little more information about these different kinds of co-sleeping. Read on to learn more about bed sharing and room sharing! Bed sharing is pretty straightforward: if you share a bed with your child, you are bed sharing! Most families bed share by hosting their child in their bed either some nights or all nights, typically all night long. 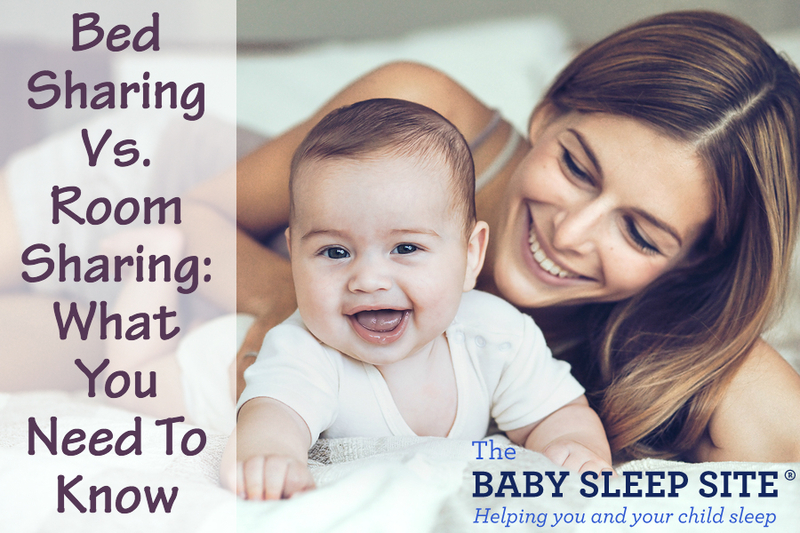 Bed sharing has obvious appeals; it makes nursing easier, for starters, and it allows for fast and convenient comforting if your baby gets upset. When your baby is sleeping right next to you – literally RIGHT next to you – you eliminate the need to haul yourself out of bed, to walk down the hall, to pick your baby up, etc. Room sharing, on the other hand, involves sharing a room but NOT a bed with your baby. Parents who room share often start by sleeping their babies in a bassinet right by their own bed, in a kind of side-car arrangement. This makes nursing and middle-of-the-night comforting easy and convenient. As a child grows, parents usually move the child to a crib in a corner of the room, and then eventually out of the room altogether. Bed Sharing vs. Room Sharing: Which Is Safer? It’s important to address safety first. Room sharing is safe, as you might imagine; you and your baby have separate sleeping spaces, which ensures that there is no risk of suffocation or smothering to your baby. Bed sharing, however, is inherently risky, specifically when it involves young infants. As rates of bed-sharing continue to rise in the United States, so do the rates of infant deaths related to bed-sharing. The most obvious danger related to bed-sharing is suffocation. An adult (or an older child) can roll on top of a baby, or the baby can be smothered by the large pillows and heavy blankets that most adults use in bed. Some less obvious dangers include a baby falling from the mattress to the floor, or a baby becoming wedged between the mattress and the headboard/footboard or wall. The mattress itself can also be a threat; if it’s overly soft, a baby can sink too low and suffocate. Bed Sharing vs. Room Sharing: Which Works Better? We have to draw an important distinction here between two types of people who bed share: those who bed share because they practice attachment parenting, and those who bed share because it is convenient and allows everyone to get more sleep. Attachment parents who bed share already believe that co-sleeping (in the form of bed sharing) “works”; in fact, as a rule, they generally believe that it is the best sleeping arrangement for young children. As for parents who bed share because it is convenient, bed sharing can be convenient for some families. Some families really do find that everyone in the family gets more sleep with bed sharing, simply because it makes nursing and middle-of-the-night comforting so much easier. That said, other families find that bed sharing is NOT a solution for sleep. These parents usually report that they are terrified of rolling on top of their babies, or of accidentally pushing a blanket over the baby’s face or something. What’s more, some parents tell us that they actually sleep worse with baby in the bed, since ever movement or noise the baby makes wakes mom and/or dad. As for room sharing: in our experience, room sharing offers all the same benefits of bed sharing, provided you sleep your baby in a bassinet or portable crib that is right next to your bed. The Arm’s Reach co sleeper, for example, allows your baby to sleep right next to you, on the same level as your mattress, and to be literally just arm’s reach away. A sleeping arrangement like this has all the benefits of easier nursing and comforting, but it allows you to avoid the suffocation and smothering risks associated with bed sharing. As your baby grows and becomes more mobile, you can transition her a pack-n-play or a crib and keep her close by your own bed, in order to keep middle-of-the-night soothing relatively easy. This isn’t quite the same as bed sharing, obviously, but it does serve the dual purpose of making midnight wake-up calls easier while also keeping your baby safe. In fact, the American Academy of Pediatrics rates room sharing as the safest of all sleeping arrangements, although it doesn’t specify an age-range during which room sharing is best. For this reason, we often recommend room sharing over bed sharing. Of course, we respect parents’ philosophies and goals, and we have worked with many attachment parents over the years who wanted better sleep while still sharing a bed with their little ones…and we have helped to make that happen! But when we talk to parents who are desperate for more sleep, and who are considering bed sharing to make that happen, we often advise that they try a room sharing arrangement instead. That said, if having your baby in your bed or even in your room is making your sleep worse, instead of better, you may want to consider moving your child out and into his own room. Room sharing has some distinct benefits, but like any sleeping arrangement, it can backfire. This post on how room sharing affects your baby’s sleep and YOUR sleep offers some good insights into how this backfire can work. Bed Sharing vs. Room Sharing: It Doesn’t Have To Be YOUR Bed or YOUR Room! A final note: when we talk about bed sharing and room sharing, many parents automatically assume that we are talking about baby sharing mom and dad’s bed or mom and dad’s room. But the reverse can also work: for a season, in order to get more sleep, you could share your toddler’s bed, or your baby’s room. In fact, if you want to co-sleep for a season but are looking to transition away from it soon, this is a great arrangement. Here’s how bed sharing in your child’s bed usually looks: you and your child start out by sharing a large blow-up mattress on the floor, where you sleep all night together. Then, you gradually fade out the ‘sleep together’ part until your child is sleeping in his own space and you are sleeping in your own room. Room sharing is similar; you’d start out by sleeping all night on a mattress in your child’s room while your child slept in her own bed; then, gradually, you would fade that out until you no longer need to be in the room with your child during the night. The benefit of doing bed sharing or room sharing this way is that your child never comes to associate YOUR room or YOUR bed with sleep, and that makes it easier to transition away from co-sleeping easily (if that is your goal). Additionally, it kind of frees up your bed, which can be nice: if your child falls asleep and you are able to sneak out of her room, you can score some quality sleep in your own bed. Do you bed share or room share with your child? Did bed sharing or room sharing help your family get more sleep? Scroll down to share your stories and tips, to ask questions, and to hear from other parents just like you! Co Sleeping With Baby: A Solution For Sleep Problems? Sharing room with a baby is really a cause of concern for new parents. sometimes have to face some problem with a newborn baby and this getting upset mom. Thanks for sharing nice blog how to sharing a bedroom with the baby. @Meghan, Thank you for taking the time to comment. I am glad that you found our article on room-sharing so helpful! We’ve tried both bed sharing and room sharing. My daughter is just about 4 months old and I started bed sharing the night she was born due to nursing. I accidentally feel asleep with her in my arms. Of course it made me super nervous and it still does! We’ve tried a few times to put her back in her bassinet but some nights I’m so tired, I fall asleep with her in our bed between us. I suppose I’m somehow conscious of where she is because nothing bad has happened. I am going to try room sharing again now because she’s beginning to roll and there’s the potential for her to fall of the bed or get tangled on the sheets.